Maina was never reinstated into the civil service – Oyo-Ita – Royal Times of Nigeria. 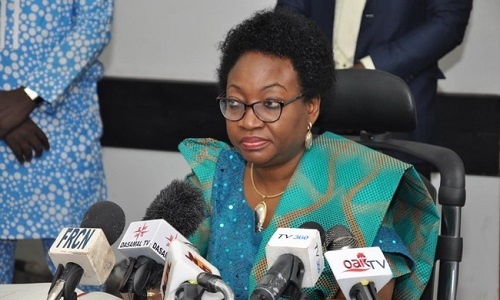 Head of Service, Winifred Oyo-Ita has said wanted former chairman of the Presidential Task Force on Pension Reforms (PTFP), Abdulrasheed Maina was never reinstated into the Civil Service. The House of Representatives had setup an ad hoc committee to probe Maina’s reinstatement. Oyo-Ita said she received a copy of a letter from the office of Abubakar Malami, Attorney-General of the Federation asking for Maina’s reinstatement. She however said didn’t release the letter to Maina. Oyo-Ita said,“I just want to make a point that the reinstatement of Maina was never activated and this actually evidenced by the letter number 29, that is the letter from the federal civil service commission to the head of the civil service of the federation dated 7th November 2017,”. “Allow me to read paragrapgh two and three of the letter: The federal civil service commission extensively deliberated on the circumstances that brought Mr Maina back into service and also Mr President’s directive that he be disengaged from service with immediate effect. “Consequently, the commission resolved to reaffirm its earlier decision dismissing Mr Maina from the service with effect from 21st February 2013. “In arriving at this decision, the commission noted that all along, the commission had considered the administrative aspect of the case in accordance with the PSR030413 which is punishable by dismissal and that the letter reinstating Mr Maina has not been delivered and therefore the reinstatement has not been effected. “So, I am confirming here that so far as the letter was never delivered to Mr Maina, he stands dismissed, he was never reinstated into the service And with this, the commission also approved that the earlier letter of reinstatement issued in respect of Mr Maina which was not delivered and till date has not been delivered be returned to the commission.